March 6, 2009 is a date I've been looking forward to since last year at Comic Con when it was announced that it would mark the official release date of the movie adaptation of arguably one the most important graphic novels of all time. Sure, I had my initial doubts and misgivings; but from what I've seen so far, Zack Snyder and company have pulled this one off, in a big way. I've re-watched the trailer countless times, and have been keeping up to date on the video journals Warner Bros. has been releasing every month. The October journal released earlier this month focused on how they're bringing Dr. Manhattan to life, and included in as of yet unseen completed scene towards the very tail end. It's the scene towards the beginning of chapter one, where Rorschach goes to the military base and enters to the sight of Dr. Manhattan towering over him working on his machines. Even on a small computer screen, in crappy resolution, it totally works. Manhattan looks just as powerful in motion as he needs to be, and the CG work is pretty impeccable, he feels real. Aside from the impending movie, the best part of being a Watchmen fan right now is seeing everyone else catching the fever. I heard a figure that said that ever since the release of the trailer in front of Dark Knight, the trade paperback has been the top selling graphic novel every month. I was also at Mid-Ohio Con the weekend before last, and everyone there was pumped and displaying their Watchmen issues on premium rack-space, and selling them for top dollar. Most vendors I talked to said that prices on the original run are going up in anticipation of the movie. A set of all 12 issues of the original run in good condition was going for $250 easily, and that number will probably only get higher. Right now, I'm looking forward to a new trailer, which will purportedly run in front of Quantum of Solace this November. I'll also be watching the Spike TV Scream Awards on October 21, as Warner Brother has promised a showing of new footage from the film during the ceremony. It's likely to just be the reel they showed at Comic Con this past year, but that certainly better than nothing at this point. 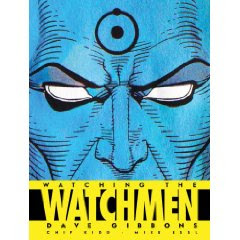 That same day will also see the release of a new book by Watchmen artist Dave Gibbons entitled "Watching the Watchmen"; a comprehensive look behind the scene of the conception and making of the graphic novel.